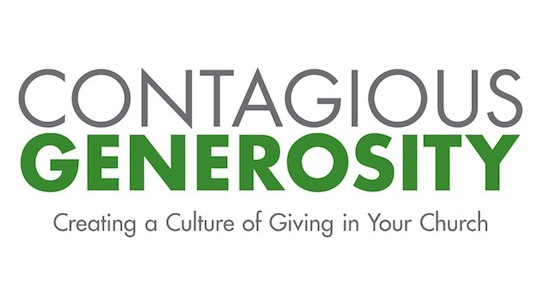 First, make giving to the Lord’s work your top financial priority. The Bible calls us to honor the Lord with the first fruits of our wealth. I believe 10% of our gross annual income is the starting goal. Next, have an Emergency Savings Account. Start with a $1,000. Build it up to 3-6 months of your income to be prepared for unexpected expenses. It is more essential than a long-term retirement account. Third, pay off debt. Consumer debt like credit cards, store accounts or loans from family and friends needs to go first. After that, pay off student loans and mortgage loans. Fourth, have an up to date written will. If you don’t have a will, the government has one for you and you won’t like it. This is essential for married couples – especially those with children. Fifth, be sure you have proper insurance coverage. It is best to have some level of health, life and disability insurance. Regarding your property, at a minimum protect against catastrophes. Sixth, automate a long-term savings plan. If you company offers a matching plan, take advantage of the maximum benefit. While investing and retirement planning are important, I find many people jump to that step and skip over some of these basics. By covering this list first, you will be in a much better position to manage day-to-day financial challenges. Even more important is making giving your top priority. This step helps keep your financial priorities in order. Chuck Bentley is the CEO of Crown, the largest Christian financial ministry in the world, founded by the late, Larry Burkett. visit Crown.org for more. We are to love Jesus, even though we cannot see Him or touch Him. This may go against common sense, but the reality of His grace and impact can sometimes be hidden by our desires, circumstances, and feelings. The same as it is with faith and finances, each one should influence the other as a mark of true Christianity. This is the test of faith and trust, if we see no hope, we then must look to our Lord; then the hope is given and can be seen. The reward of our faith far outweighs any endurance or struggle we face. The joy we have is real and significant (John 20:29). Read Matt. 25:14-30: What is the meaning of unfaithfulness? 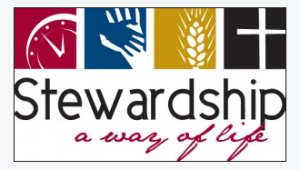 How does that relate to stewardship? Stewardship is the wise use of our materialistic goods and abilities, as well as with our time. Wasting time, in the eyes of the Puritans, was a sin, and that notion did not originate with them, but with God’s Word. Stewardship is being neither reckless nor hiding from our duty by playing it safe. Read Psalm 24:1; Acts 20:35; 2 Cor. 9:7; James 1:17: What are the standards for stewardship we are having? 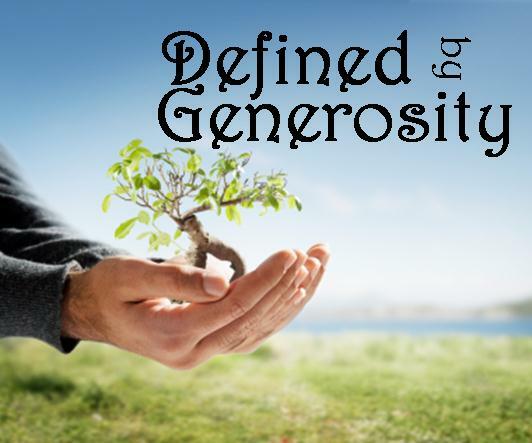 Stewardship is proportionate to what we are able to give. The poor person’s small gift is just as important as the rich person’s big gift! Sometimes, we cannot give as much as we would like to, due to economic realities, job loss, business not good, sickness, etc., so, we give honestly and efficiently whatever we can. What are some of the things you can do to make sure that your heart is not set upon possessions; more exactly, how can you trust in our God as Provider? All this is a result of His sacrifice of Christ’s redemption, His permanence, and His love for us. He lived, died, and rose again for you and me! All we are to do is trust and obey Him, and as we continue in this endeavor, He gives us even more empowerment for enduring life and performing ministry along with His special favor and peace! Even if we do not see Jesus, He sees us, loves us, and helps us persevere. This may seem unattainable or even unfathomable when we are under stress or the hostile occupation of life. However, we can do this because we have access to His empowerment; we are literally kept by God through faith. As we grow in our faith, we become even more precious to God and He will preserve us through trials and life. From this passage we can see what we gain by our Lord’s grace, so how will that affect our budget and giving? What we can do is view your promise to give to God that which is referred to as your tithe, like an income tax. Although it is not mandatory, it is a reflection of your character and response to His grace. As the government so nicely swipes away your hard–earned money from the top of your paycheck, consider joyfully setting also the top 10% of your net, or better yet, the gross income, for the Lord’s service– before the bills, expenses, and entertainment. 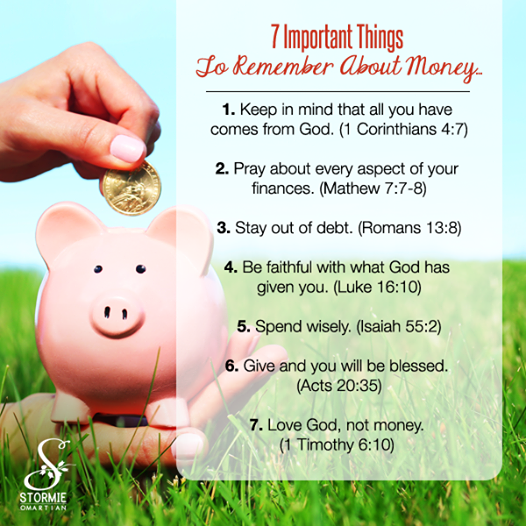 Do not include the tithe in your budget. 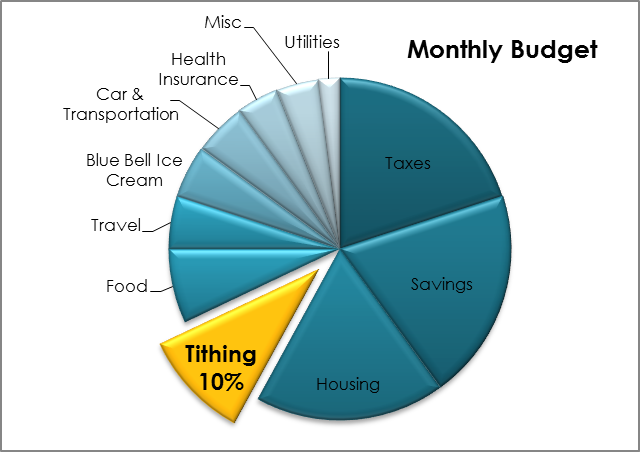 Make your budget on the net assets you have after the tithe and taxes. Then, you will have a more realistic budget and keep yourself from getting into debt. That way, it is done and out of the way. Then, carefully decide to whom it should go. The primary responsibility is first to your local church, and second to ministries that are doing the Lord’s work. Remember, the people who set aside the first fruits of their resources to God are dedicating themselves to God, and not themselves to themselves. This will also allow you to give more easily and continuously. Our real and true treasures are imperishable (1 Pet. 1:3-5)! To help you do this, make a list of them, and put them in a place that you can see daily to encourage yourself. Keep in mind that true treasures are not material in nature, so look to relationships and character. Do you realize that the prophets of old desperately desired and sought what we have—that which is free, and that we take for granted? Never take your faith or what Christ has done for you for granted. If you do, your spiritual journey will derail, your faith will stagnate, and the hopeless gloom of the world will be your only “vesper” (a bell that summons monks to pray). You will be seeking what is feeble and worthless and disavow what is real and jubilant. We are to declare our faith internally, see its veracity and application, and then declare it publicly.